As a Bail Bondsman, you provide the funds needed for individuals to be released from jail while they wait for a court appearance or trial. After the individual appears in court, the funds held are released, but the Bail Bondsman keeps his fee. Based upon today's arrest statistics, you can see why the Bail Bond Business is so lucrative. If you've driven with an expired license, raised your voice at your neighbor or your spouse, got a little too rambunctious or drunk in public, puffed pot, or did one of thousands of other things that don't seem like a world shattering crime, but you got arrested anyway, you're not alone. One in seven Americans has an arrest record. Why is the justice system so anxious to make arrests? Because arresting people is a lucrative revenue-generating scheme. When someone is arrested, whether guilty or not, if they don't turn over some cash, they're going to spend time in jail waiting for a court appearance or trial. Unfortunately, many people don't have the required cash on hand. This presents an opportunity for you. As a Bail Bondsman, you provide, for a fee, the funds needed for individuals to be released from jail so that they can get back to their lives while they wait for a court appearance or trial. After the individual appears in court, the funds held in the bond are released, but the Bail Bondsman keeps his fee. Based upon todays arrest statistics, you can see why the Bail Bond Business is so lucrative. 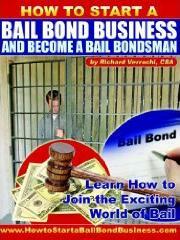 This book provides a step-by-step introduction into the Bail Bond Business, discussing the history of bail, licensing, setting up your business, promotion, advertising, valuing and selling your business, etc. In addition, the book is filled with intenet links and email addresses of companies and people who can help you to start your business. Reader David says,"If you are someone considering the entrepreneur's penultimate foray - owning and operating a bail bond business - Richard Verrochi's book, How to Start a Bail Bond Business and Become a Bondsman, is both commendable and, really, indispensible. "A former stockbroker, Mr. Verrochi succinctly, and yet quite clearly gives an overview of the history of bail, its role in the justice system, and the risks and rewards involved. One of the more appealing aspects of the work is that although each state posits its own rules governing the industry, Verrochi has created a work which might be regarded as a universal manual; from Alaska to Maine, the principles, 'secrets' and recipes for success are all laid out. "Verrochi's own personal enthusiasm for the industry is clearly evident as he explains why he left his former profession (undoubtedly lucrative) to venture into the unknown world of bail. Like a beacon in a sea of the unknown, the book details the types of defendants one deals with, the symbiotic relationship between agency owner, managing general agents and surety companies, as well as providing an important overview of related businesses which can handsomely supplement one's income as a Bail Agency owner.